Creative 360 will host a Yes We Can! Tuesday Tribute in honor of artist, advocate, educator, writer and volunteer Dr. Joyce Henricks (83) on Tuesday, April 9, 2-3:30 p.m. Guests will enjoy lively conversation, tea and treats. Admission is $5. Dr. Henricks was born and raised in Brooklyn, New York. She moved to Michigan to attend graduate school and stayed when she found employment at Central Michigan University (CMU) where she taught for 42 years. 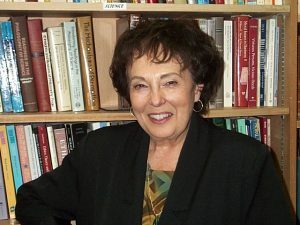 While at CMU, she founded the Women and Gender Studies Program. Now officially retired, Henricks teaches an occasional course, serves as a speaker on feminist theory and philosophy, and continues to be an advocate for women’s causes. She is active on the boards of Shelterhouse in Midland and the Isabella County Restoration House. A published author, her experiences raising a family and teaching influence her writing. 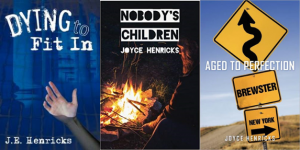 Her three mysteries – “Dying to Fit In,” “Aged to Perfection” and “Nobody’s Children” are all available from Amazon and other booksellers. “Nobody’s Children” grew out of her work on the boards of local homeless and women’s shelters. Creative 360’s Tuesday Tributes offer an opportunity to hear from and about an array of fascinating seniors – their lives, their creative process, and their adventures. Always on Tuesdays at 2:00 p.m., they offer lively conversation, tea, treats, and time for Q&A. There are ten Tuesday Tributes in the Yes We Can! schedule this year.